“It’s a beautiful day.” For more than 20 years, Dr. Claude Caldwell has made it a point to address almost every class he’s taught in China with these four words. 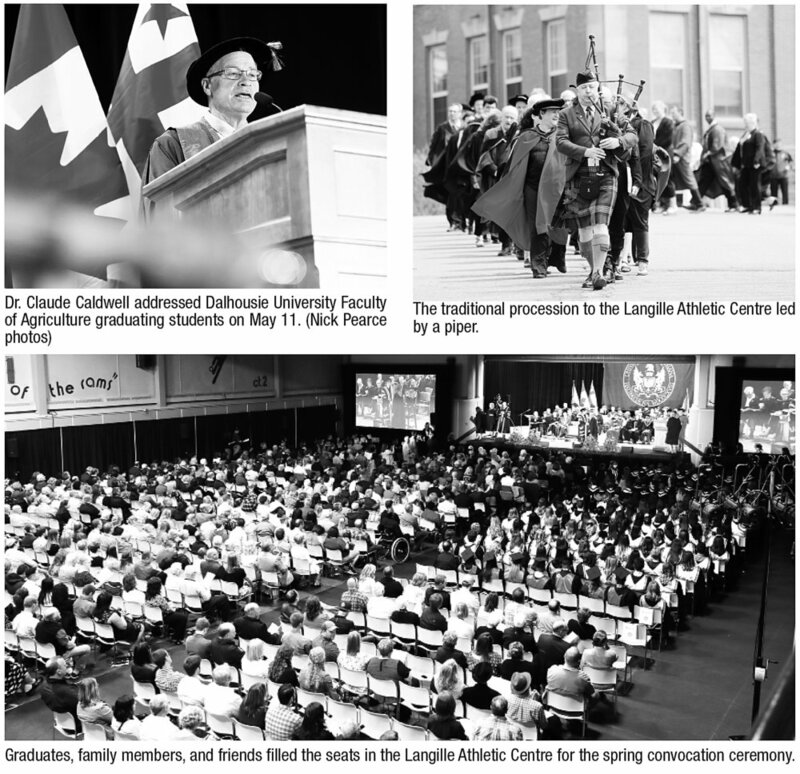 And it was no different for Dalhousie University Faculty of Agriculture graduating students on May 11. “If you remember nothing else today, remember it is a beautiful day,” he told members of the Class of 2018 during their convocation ceremony. Caldwell, now retired as a Faculty of Agriculture professor but remaining as professor emeritus on the campus, shared wisdom and insight with the Class of 2018 during his address. Caldwell’s insightful advice to students: be present, life is not a competition, and any day can be a beautiful day if you choose it to be. For 34 years, Caldwell has been a staple at Dalhousie University’s Faculty of Agriculture. Beginning in 1983 as assistant professor of plant science, he had only intended to stay on the campus for five years. Thirty-four years later, Caldwell retired last summer. After his retirement in June 2017, he found himself drawn back to Dal AC as professor emeritus. In addition to his continued teaching and research, Caldwell also works as the chief scientific officer for Field to Fork AgriSystems Consulting, a consulting firm specializing in various aspects of agricultural production, food and feed processing, food marketing, facilitation, and agri-food education. Trained in the United Kingdom as a biophysicist and crop physiologist, Caldwell has worked extensively in a number of areas all over the globe. With experience in a variety of cropping systems, agricultural technologies, crop development, and agricultural ecosystems, his 34 years of service are irreplaceable. In addition to his teaching and research on campus during the past 34 years, Caldwell has supervised many graduate students in plant culture and management and international cropping systems. His international experience involves work in China, Vietnam, the Philippines, Indonesia, Jamaica, Trinidad and Tobago, Gambia, Cambodia, Tanzania, and Ethiopia. He also played a large role in establishing the academic and research collaborations between Dal AC and Fujian Agriculture and Forestry University (FAFU) in China. Reflecting on his time at Dal AC, Caldwell said he stayed for 34 years because of the varied opportunities he was given in his position. Each day was something different, which made for a challenging yet rewarding career. With so many experiences under his belt, it’s difficult for Caldwell to pinpoint a favourite part of his time spent on the Dal AC campus, but he did reflect in particular on his time spent helping students open their minds and how rewarding it was for him.